As cheap as the apartments are at AD The Grand Jomtien, they are not the cheapest that Jomtien has to offer – or the entire Pattaya area. If you are looking for the most affordable apartments in this book, you have found them here at Aba Talay. The developer of Aba Talay has definitely gone with the ‘pile ‘em high; sell ‘em cheap’ philosophy when it comes to this development. There is just one size of apartment here – 23.1m2 in size which are configured as studios. Starting prices for these units is an excellent THB 825,000, which makes them substantially cheaper than any of the other apartments in this book. 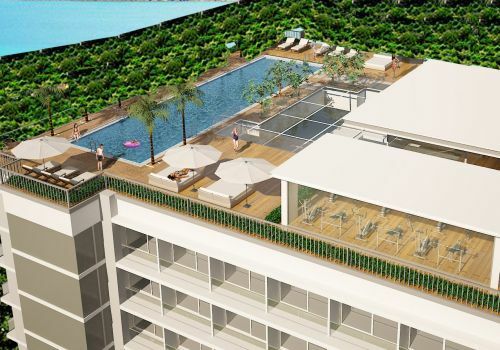 So if you are on a tight budget and looking to get a foot on the Pattaya property ladder, a studio at Aba Talay could very well be your only option. All of these 23.1m2 units are designed in a modular style, with the ability to combine two or more units in order to create larger-sized apartments. Two of the units can be combined to create a 46.2m2 one-bedroom apartment. With the majority of one-bedroom apartments in Pattaya coming in around 35m2 these days, 46.2m2 is now a fairly large unit. This is great if you are looking for plenty of space at a good-value price/m2 but, if you are looking for the most affordable one-bedroom units, the starting prices of THB 1.65 million that would be the cost of two units is not such a bargain. You would be better off looking at AD The Grand, one of the Jomtien resorts or the much better located City Garden Pratumnak. Aba Talay becomes more competitive with their two-bedroom/two-bathroom option, where you can get a reasonably sized 69.1m2 apartment for THB 2,475,000 – not quite as cheap as the units at AD The Grand, but substantially better value considering the unit size would be around 40% larger. Despite the fact that the apartments here are so affordable, Aba Talay does not scrimp on the facilities. Design-wise, it is almost identical to Pratumnak boutiques such as Art on the Hill and Laguna Bay 1 in that it has apartments on four sides surrounding a central atrium. On the roof is the now seemingly mandatory infinity pool and fitness centre set among roof gardens which will offer sea views. So the reason why Aba Talay is such good value for money has nothing to do with a lack of facilities, it is purely down to location. 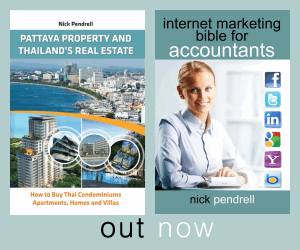 Of all of the Jomtien developments featured in this book, Aba Talay is the one furthest from the sea. Whereas it is feasible to walk to the beach from all of the other developments here (albeit quite a long walk), you are definitely going to need some form of transport to make the trip from here. There is also little in the way of shops and restaurants within easy walking distance either, although this will definitely change over time. Despite these disadvantages, you really can’t go too far wrong buying a studio in Aba Talay as the most affordable property is always a safe investment strategy. It’s impossible to find anywhere in Pattaya in a modern building with a pool and a gym for under THB 10,000/month. Even if you priced a studio here for just THB 8,000 per month, you would still be achieving an annual yield of over 10%, which is a lot better than the returns from most of the more expensive apartments in Pattaya.